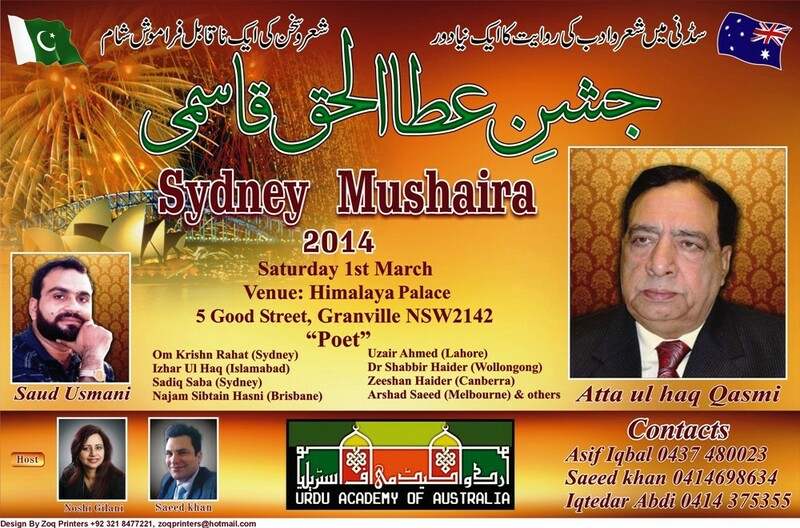 The Urdu Academy of Australia Inc. is pleased to announce its 2014 International Urdu Mushaira Program. To continue the long standing tradition of promoting Urdu language and culture in Australia, next year’s Mushaira Prgram will present a series of events in Melbourne, Sydney and Canberra during months of February and March. The Academy of Australia Incorporated is a not for profit literary and cultural organisation. The Academy has been organising literary events in Sydney since 2008 and in Melbourne since 1995. Regular literary sittings (Nashist) are held to promote and develop Urdu language writings in Australia. A major Sydney recital (Mushaira 2014) has been planned to honour and celebrate the works of legendary writer, dramatist, poet and columnist Mr Atta Ul Haq Qasmi. Given Mr Qasmi’s contribution as one of the most renowned Urdu writers of our time, the main festival is being named “Jashn-e-Atta”. Mr Qasmi is the current Chairman of Alhamra Arts Council, Lahore has also served as Pakistan’s ambassador to Norway and Thailand. His books of columns include “Column Tamam”, “Shar Goshiyan”, “Hansna Rona Mana Hay”, “Mazeed Ganjey Farishtey and many more while his TV Drama Serials include the most popular “Khwaja and Son”, “Shab Daig” and “Sheeda Talli”. His travelogues include “Shoq-e-Awargi”. Mr Saud Usmani, an outstanding contemporary poet from Lahore, is a special guest at the recitals. Mr Usmani has an outstanding reputation for his poetic works and delivery and has been recognised with “Prime Ministers Award for Poetry 1997” and “Ahmed Nadeem Qasmi Award 2007”. Ms Noshi Gilani (Sydney) – The most celebrated female poet of her generation, author of five collections, Ms Gilani will be hosting the Sydney event. A selected list of local and international Urdu poets will also be reciting at the Sydney event. 00612 – 414 698 634.